Whether you’re thinking about redoing your home driveway or installing a pool deck in the backyard, you’ve probably got a few different options running through your mind. You may be considering how you want the finished product to look, how well it will last over time, and how much it’s going to cost to add this new feature to your home. These questions are all common concerns for any home project! A standard gray slab of concrete may not be your first choice, but that doesn’t mean you should swear off the idea of concrete entirely – especially if aren’t entirely familiar with “stamped concrete” yet. In fact, stamped concrete can be a unique and attractive option for leveling up home aesthetic! Wondering what stamped concrete is all about? Read on for an overview of what stamped concrete is, the benefits of using stamped concrete over brick or stone, and how you can customize it for virtually any look! As the name suggests, stamped concrete is an elevated form of the traditional concrete patios, pavers, and driveways you’re probably already familiar with! 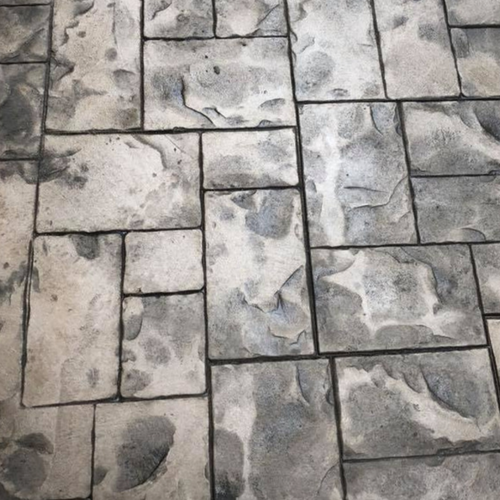 Regardless of the space you’re designing or repairing, stamped concrete starts with pouring slab concrete into the empty space and using molds to impress both patterns and textures into the finished product. The result is a more visually appealing and custom option. What Makes Stamped Concrete Better than Other Options? Imagine you’re thinking about repairing or replacing the driveway in front of your home. You already know that where curb appeal is concerned, your driveway has the potential to make or break your home aesthetic, and you want to make sure you pick something that will be as beautiful to look at as it is functional to use. Opting for a concrete driveway means you’ll have peace of mind that the finished surface is both strong and durable enough to withstand everything from traffic to intense weather. And because they can last for 25 to 50 years, and keeping up with concrete isn’t as tedious or challenging as some other surfaces, opting for stamped concrete is one of the smartest options for your home. And best of all, stamped concrete won’t break the bank. Brick or cobblestone driveways could cost you more in the long run, and as we’ll explore below, you can achieve a similar look and feel with stamped concrete instead. Cost and durability are great, but they might not mean as much if we can’t achieve a finished look you’ll be proud to call home. You can forget about those visions of dirty, cracked concrete. With new trends in texturizing and pigmenting, you might be surprised how high-end stamped concrete will look on your decorative patio. Since concrete can be poured into nearly any shape or size, it’s perfect for the landscaping you already have. Whether you’re looking for a light finish for a more modern touch, or warm earth-tone hues for a traditional design, the possibilities are truly endless! 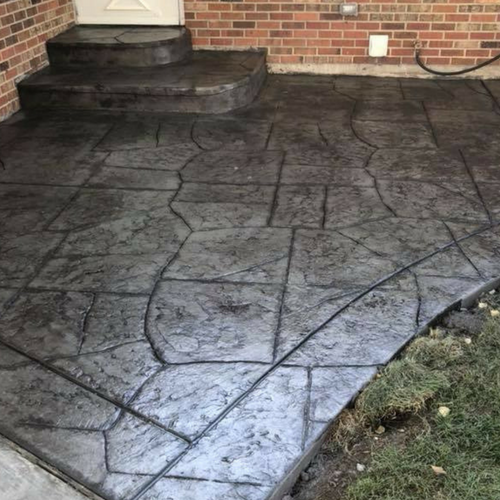 No matter what you’re trying to create, from refinishing your concrete driveway to installing the backyard space of your dreams, stamped concrete should be at the top of your list of options! Now that you know how durable it is and how customizable your finished look can be, let the Concrete Company help you find the experts you need to get your renovation started. Contact us today if you need a contractor and for your free no obligation quote!